As I mentioned a few weeks ago, we’re raising money for a new team to fight disinformation here at Mother Jones. Our fundraising drive is nearly over, so I wanted to make one more pitch for contributions. I think that conventional wisdom says that fundraising appeals should either be scary or hopeful, but I can’t honestly do either one right now. I’ve been blogging for 15 years, and there’s never been a day when I wanted to stop. That includes all the George Bush years, all the obstruction years, and even last year. But it’s getting harder. Donald Trump has really gotten to me. Atrios likes to remind us that George Bush was a worse president than Trump. Technically, that’s true: he launched a stupid war that killed thousands of people and probably prevented us from winning the war in Afghanistan that we really needed to win. Trump hasn’t done that yet—though he might, given time. But there’s more to a president than that. There’s also the content of his character. I will never let Bush off the hook for approving the torture of enemy combatants, but at least he had the excuse of doing it right after 9/11 and the decency to be sort of embarrassed about it (thus the euphemisms). Trump, by contrast, considers it “strong” to loudly and proudly support torture—and the worse the better. Bush also wasn’t racist, something he demonstrated a number of times. Trump appeals to the worst kind of racist and xenophobic sentiment, and he’s dragged the entire Republican Party along with him. Bush lied like any other politician when he needed to, but Trump casually lies about everything just for the hell of it. He’s also ignorant, deliberately nasty, and has based nearly his entire presidency on taking revenge against Barack Obama. I could go on. This makes Trump far worse to take on a daily basis. It’s one thing to understand that writing an analytic blog doesn’t really have much chance of changing things, but it’s another to live with a president who has simply made facts irrelevant. What’s the point of refuting lies that everyone knows are lies and no one even bothers defending in the first place? This is why I’m actually pretty excited by the idea of a disinformation team. My style of blogging isn’t well suited to the Trump era, and it’s obvious that the mainstream media is almost completely hamstrung in dealing with it. We need something new, and I hope this team comes up with it. Not snark, not PolitiFact, and not reams of charts. Something better. But we can only do this if we get the money to get this team going. And there’s nothing that would make me happier than for my audience to pitch in bigly for this effort. You contributed $14,000 last time I asked. How about another $14,000? Click here to make a tax-deductible donation. We hope to raise $350,000 before June 30—$250,000 to meet our budget, and an extra $100,000 to get this special project off the ground. There’s no better cause. Or, if money is tight, click here to find out other ways you can help. 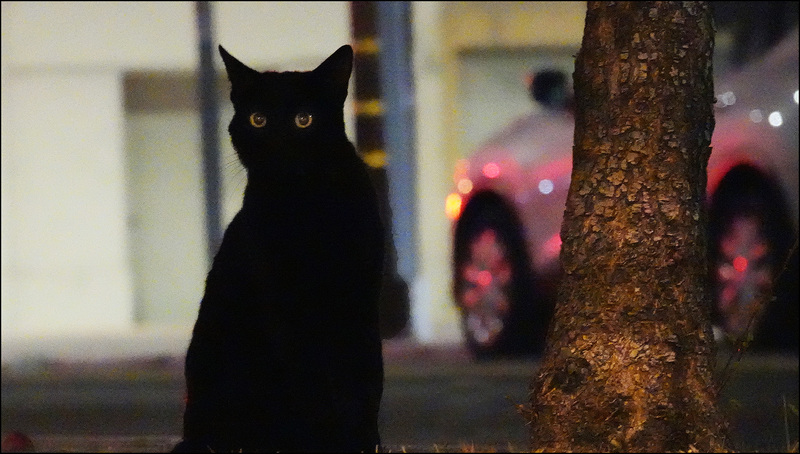 And here’s your reward: a cat that I photographed in Los Angeles last night at the corner of Eagle and Clarence. He is watching to make sure you donate something.